← Navajo. not always the answer. There are three faithful friends – an old wife, an old dog and ready money. This is exactly how I feel sometimes. Oh he is so cute, I love the photo with one eye open, perfect! Thanks fo ryour suggestion on my pattern dilema. But damn I dont understand. I think my mind along with the body is betraying me big time. 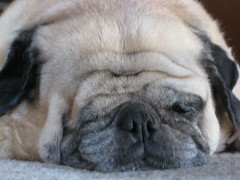 Love your old pug . They do love to sleep! That dog is beyond sweet. God I love Ben Franklin. He was such a riot! The other Founding Fathers were so stuck up compared to him. We were just at Thomas Jefferson’s little place down in Virginia and they had some of HIS hi-larious quotes like “One seldom regrets having eaten too LITTLE.” Hardy har har, ya know? “I cannot live without books.” Yer killin’ me! George Washington (whose house we also visited) was another fabulous guy but not all that much fun. I would have visited more Lifestyles of the Founding Fathers but the kids had had enough.